Interiors of the Sofitel Casablanca Tour Blanche: the reception desk, entirely fabricated in Corian® by Deborel Maroc; project by Marc Hertrich and Nicolas Adnet; photo courtesy of Deborel Maroc, all rights reserved. Behind the monumental exterior of the hotel, interiors present an ambiance that brings to mind exotic and warm reminiscences, mixed with impressive lighting and ultra-modern touches. 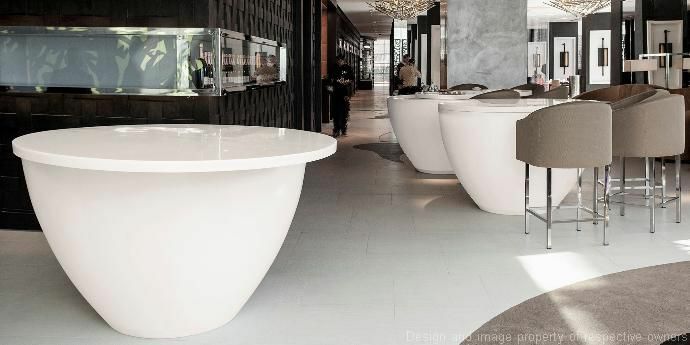 To welcome the lucky guests of the luxury hotel, there is a reception desk realized with thermoformed Corian®. The first four floors of the hotel delight guests with deluxe pampering: they include two restaurants, one bar, a spa spanning two floors, in which the techno-surface Corian® is the absolute protagonist. Here are also located three of the fascinating champagne bar counters with removable cover, which give a hyper technological touch to a room dressed in warm and elegant colors, surrounded by decorated ceilings. Interiors of the Sofitel Casablanca Tour Blanche: the champagne bars with removable cover, entirely fabricated in Corian® by Deborel Maroc: project by Marc Hertrich and Nicolas Adnet, photos courtesy of Deborel Maroc, all rights reserved. The Hotel’s spa, spearhead of the building, encloses baths, mirrors and furniture completely made of Corian®. The designers have exploited the hygienic properties of the techno-surface, a non-porous and easy to clean material. 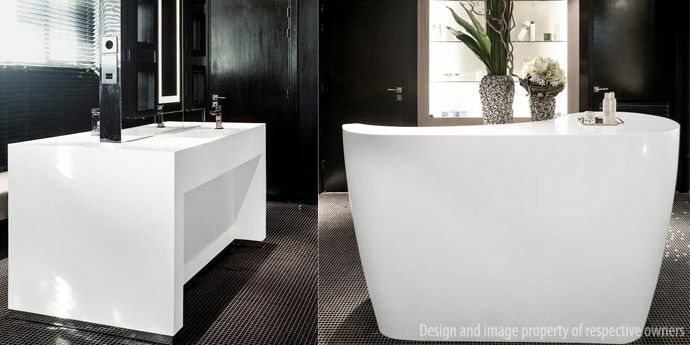 Moreover, Corian® gives an immediate relaxed feeling dictated by the smooth shapes and by the warm touch. Another precious design element of the spa are the beautiful moucharabieh made in Corian®, a contemporary interpretation of an object traditionally made of wood, that gently hide DVD players and speakers. The dualism between Moroccan tradition and chic modernism can also be appreciated in every room, in which the white bathroom furniture made with Corian® match with black sumptuous mosaic floors. Interiors of the Sofitel Casablanca Tour Blanche: some of the spa furnishings, entirely fabricated in Corian® by Deborel Maroc; project by Marc Hertrich and Nicolas Adnet; photos courtesy of Deborel Maroc, all rights reserved. All the furnishings made in Corian® have been fabricated by Deborel Maroc, who previously showed the limitless design possibilities offered by this techno-surface in another Moroccan stunning project, the Morocco Mall.